Perfect for fans of Shadow and Bone and Red Queen, The Crown's Game is a thrilling and atmospheric historical fantasy set in Imperial Russia about two teenagers who must compete for the right to become the Imperial Enchanter-or die in the process-from debut author Evelyn Skye. Vika Andreyeva can summon the snow and turn ash into gold. Nikolai Karimov can see through walls and conjure bridges out of thin air. They are enchanters-the only two in Russia-and with the Ottoman Empire and the Kazakhs threatening, the tsar needs a powerful enchanter by his side. And so he initiates the Crown's Game, an ancient duel of magical skill-the greatest test an enchanter will ever know. The victor becomes the Imperial Enchanter and the tsar's most respected adviser. The defeated is sentenced to death. Raised on tiny Ovchinin Island her whole life, Vika is eager for the chance to show off her talent in the grand capital of Saint Petersburg. But can she kill another enchanter-even when his magic calls to her like nothing else ever has? 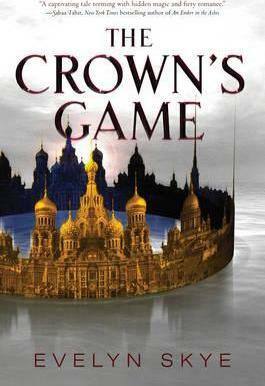 For Nikolai, an orphan, the Crown's Game is the chance of a lifetime. But his deadly opponent is a force to be reckoned with-beautiful, whip smart, imaginative-and he can't stop thinking about her. They are enchanters--the only two in Russia--and with the Ottoman Empire and the Kazakhs threatening, the tsar needs a powerful enchanter by his side. And so he initiates the Crown's Game, a duel of magical skill. The victor becomes the Imperial Enchanter and the tsar's most respected adviser. The defeated is sentenced to death. Raised on tiny Ovchinin Island her whole life, Vika is eager for the chance to show off her talent in the grand capital of Saint Petersburg. But can she kill another enchanter--even when his magic calls to her like nothing else ever has? For Nikolai, an orphan, the Crown's Game is the chance of a lifetime. But his deadly opponent is a force to be reckoned with--beautiful, whip-smart, imaginative--and he can't stop thinking about her. As long-buried secrets emerge, threatening the future of the empire, it becomes dangerously clear--the Crown's Game is not one to lose. Evelyn Skye was once offered a job by the CIA, she not-so-secretly wishes she was on So You Think You Can Dance, and if you challenge her to a pizza-eating contest, she guarantees she will win. When she isn't writing, Evelyn can be found chasing her daughter on the playground or sitting on the couch immersed in a good book and eating way too many cookies. She is the author of the New York Times bestseller The Crown's Game and its sequel, The Crown's Fate. Evelyn can be found online at www.evelynskye.com and on Twitter @EvelynSkyeYA.